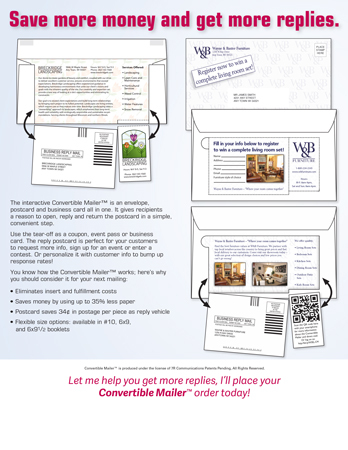 Looking for a flyer to promote a new product to your customers? 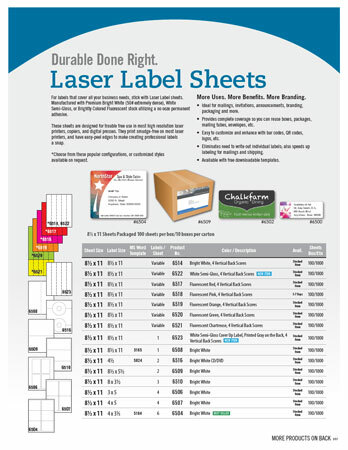 Take a look at our wide selection of customizable flyers below - You can easily download the PDF and brand each flyer with your logo and contact information. To add your logo to a flyer, open the PDF in an editing program (ie. Adobe Illustrator or Adobe Photoshop) and add your logo/contact information in the blank area. 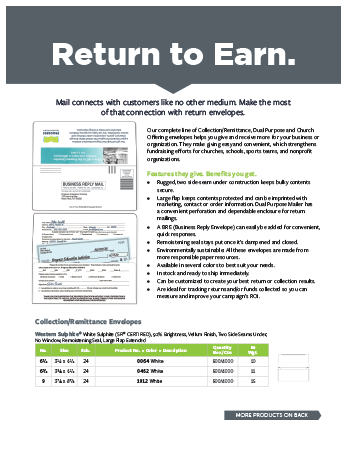 Check back for updates on these flyers as we are periodically adding new products. A "PLEASE RECYCLE THIS ENVELOPE" imprint on the back. Encourages and reminds the consumer that discarded mail can and should be recycled. 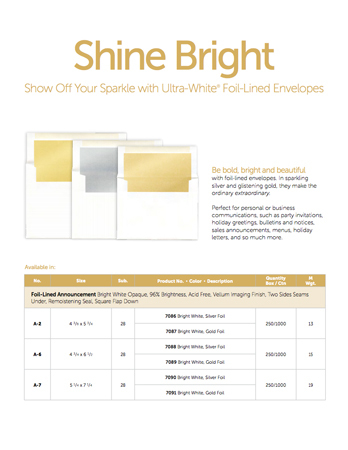 Included on our select envelopes free of charge! 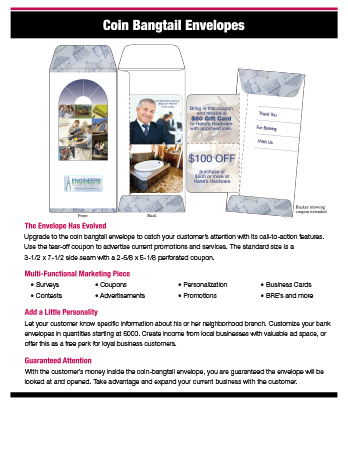 Tear-off coupon to advertise current promotions and services. Create income from local businesses with valuable ad space. 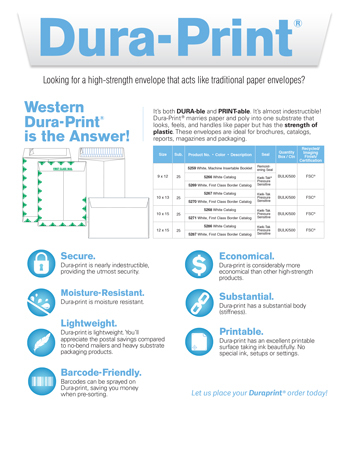 Helps eliminate inserts and fulfillment costs. Use up to 35% less paper. Water resistant, lightweight and tear resistant. 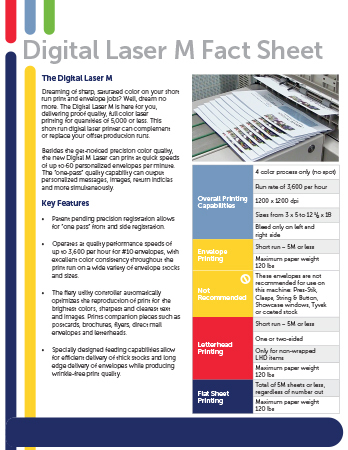 Unmatched quality for short runs on all digital four-color laser / toner-based equipment. No wrinkling or shrinkage under higher temperatures. 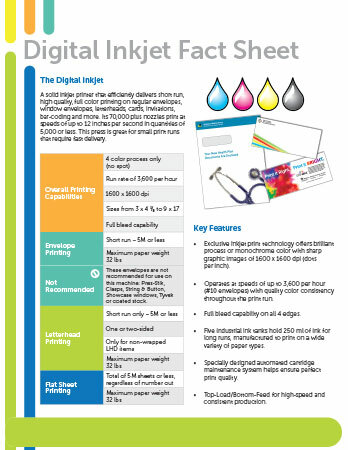 Digi-M envelopes were created using a specially developed paper to bring out the best from all inkjet printers. Achieve enhanced, rich color that truly “pops” compared to standard white wove or offset papers. Go bold and bright with Digi-M! A solid inkjet printer that efficiently delivers short run, high quality, full color printing on regular envelopes, window envelopes, letterheads, cards, invitations, bar-coding and more. This press is great for small print runs that require fast delivery. Marries paper and poly into a nearly indestructible material. Has an Excellent Printable surface that takes ink beautifully. 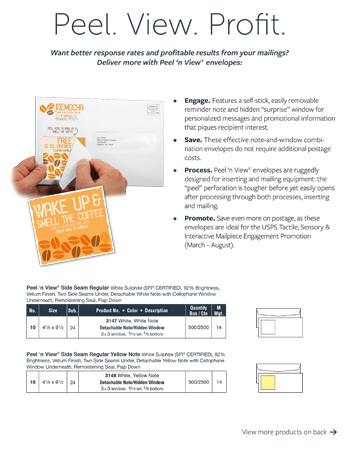 An outer envelope and a return envelope all in one. Great way to showcase your contents and your commitment to preserving the environment. Minimizes or eliminates damage to the disc during processing. Mail CDs or DVDs at automation letter rates. Tested and approved by the USPS for automation letter processing. 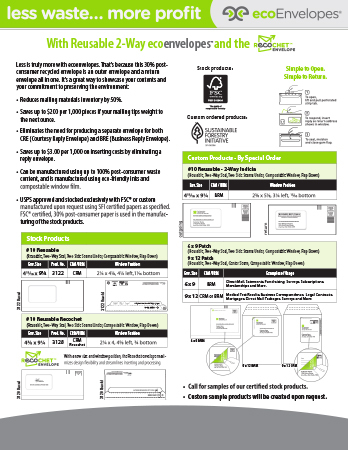 This 98% bright, FSC® certified premium imaging finish paper and card stock is perfect for everything from high-end catalogs and booklets to newsletters, direct mail, flyers, annual reports and more. It’s made with an ultra-smooth, bright white imaging finish paper for an unmatched digital and laser performance. It’s also one of the brightest and smoothest papers available for full-color printing and copying. 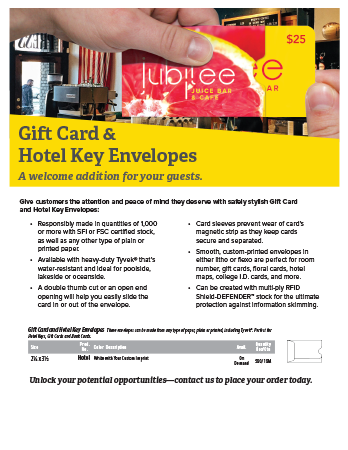 Give customers the attention and peace of mind they deserve with safely stylish Hotel Key & Gift Card Envelopes. Avalaible in festive red and green in various sizes. 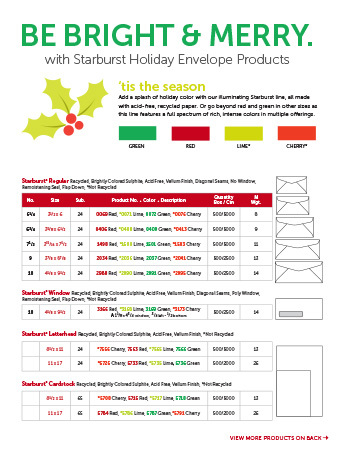 Starburst® envelopes also come in 9 other bright colors. 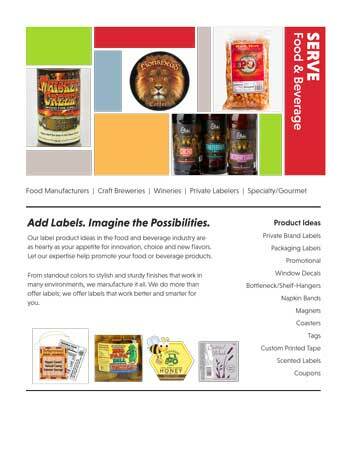 This flyer gives you label product ideas in the food and beverage industry, with a variety of tips to ensure you spec the perfect label. Made from 100% recycled paperboard and is a great alternative to plastic. Designed to reduce shipping costs: Weighs 1-2 ounces less than comparable rigid mailers; mails within USPS “Flat” or “Letter” dimensions. Perfect for sending important documents, photos, or film negatives that must not bend. The "Tan" color exhibits the current Kraft color trend and the look of recycled paper board. Features a durable, kwik-tak pressure sensitive seal and tear strip for easy opening. 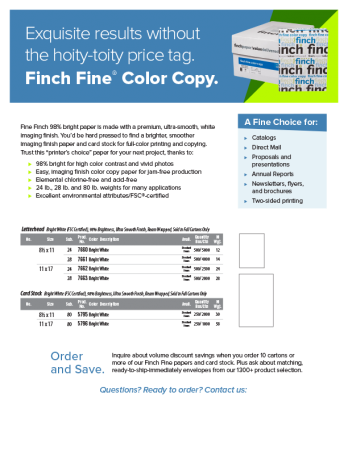 Choose from 5 tan colored and 7 white no bend mailers, or custom-create and print the right size and quantity for your customers' needs. A self-stick, easily-removed reminder note that can be placed on any surface. A hidden “surprise” window that shows a personalized message. Driving better response rates for your customers. Let us help you with your next promotion using this pastel line of Prism colors. these delicately pastel colored products, all made with acid-free, FSC-certified paper. Large flap keeps contents protected and can be imprinted with marketing, contact or order information. 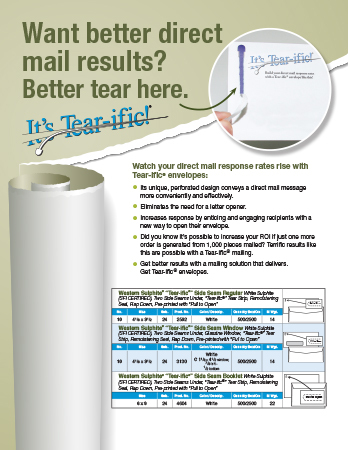 A BRE (Business Reply Envelope) can easily be printed for convenient, quick responses. Find the right hue for you with our Starburst line. All products in this striking color palette are made with acid-free, recycled paper. 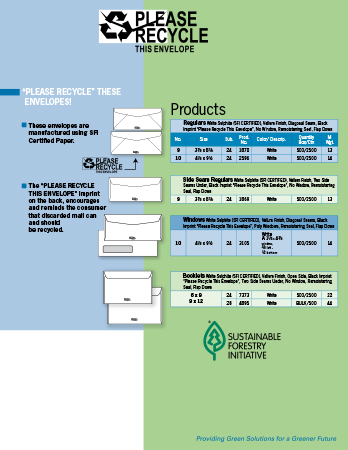 Our tax product line features a variety of window envelope styles. 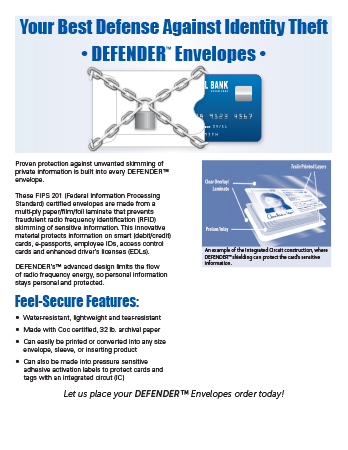 Originally designed for W-2 / 1099 IRS tax forms, these envelopes have a variety of other applications as well. Eliminates the need for a letter opener.